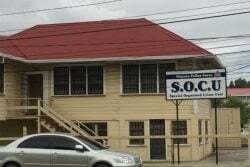 The Guyana Police Force (GPF) records show that armed robberies have decreased by 19.6% since last year and credit is being given to increased anti-crime patrols and intelligence gathering. 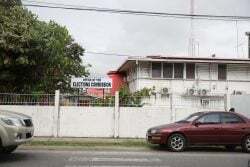 Crime Chief Seelall Persaud, quoting from Criminal Investigation Department (CID) statistics, told Stabroek News on Thursday that there were 703 robberies up to December 14, 2010—171 cases less than the corresponding period for last year. Despite the success of police, there have been several well planned armed robberies committed on homes and businesses within the last few weeks and in those incidents, substantial amounts of cash were taken. 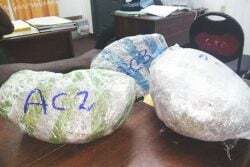 Police Commissioner Henry Greene has said that criminals are now focusing on “soft targets,” in light of the heightened police presence, among other things. The following were the number of armed robberies recorded in each police division so far this year: 423 cases in A Division (Conversation Tree to Dora, Linden Highway); 112 cases in B Division (Abary, West Coast Berbice, West Bank Berbice and Corentyne); 91 cases in C Division (Conversation Tree to Abary, West Coast Berbice); 47 cases in D Division (West Demerara and East Bank Essequibo); 22 cases in E&F Division (Dora, Linden Highway, Linden, Kwakwani and Interior locations); and eight cases in G Division (Essequibo Coast and Islands). 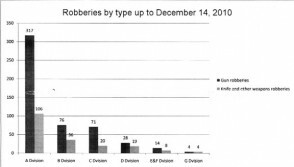 The bar graph above shows the number of robberies in the various police division categorized by the type of weapon used for the period January 1, 2010 to December 14, 2010. Throughout the respective police divisions, Persaud said, there has been a decrease in the number of recorded cases of armed robbery. Police, according to him, have been able to reduce robberies by almost a fifth of last year’s total. There were 874 armed robberies last year. There are a number of factors which contributed to this decrease in armed (guns, knives and other implements) robberies. During this year, Persaud explained, police have increased the number of anticrime patrols and more emphasis has been placed on crime intelligence briefs aimed at identifying the “players” and their modus operandi. Many arrests have been made, charges instituted and the accused remanded to prison during their trial, Persaud explained. This is perhaps another reason for the decrease. 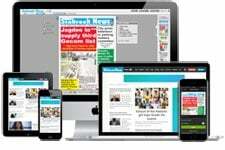 With offenders in prison, he said, they cannot repeat the offence. Efforts, he stressed, are continuing to further reduce this number. Over the last few years, according to him, there has been an annual decrease in the number of armed robberies recorded. Investigators are being continuously exposed to training, he said, to improve their crime solving skills. Enhancing personnel performance and a more reactive justice system, Persaud added, are also other measures which can continue the current trend of decrease in armed robberies. 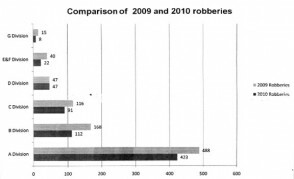 The bar graph above shows a comparison between the number of robberies in 2009 and up to December 14, 2010. There is also a continuous effort to work closer with neighbouring countries to stamp out the gun trade. The majority of robbers, according to GPF figures, arm themselves with guns. In 2009, there were 605 gun related robberies and 269 cases where robbers used knives or other weapons. As at December 14, there were 510 recorded cases of gun robberies and 193 others. These figures indicate that in 2009 and 2010, respectively, 69.2% and 72.5% of the total robberies were gun related. Gun robberies in A Division accounted for 40.1% of all robberies up to December 14. Further, all robberies in this division accounted for 60.2% of the robberies recorded countrywide so far this year. The highest concentration of the robberies, Persaud said, has been committed in towns. It is unclear how many of the 423 robberies in A Division were committed in Georgetown. He further said that so far this year 23 licensed firearms were stolen during robberies. 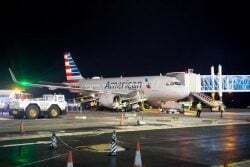 In many cases, he said, victims were armed but were either relieved of their weapons, chose not to use it or did not have it on their person or within use. 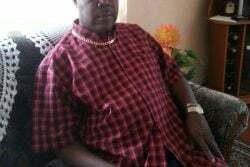 During November, after Chateau Margot businessman Dennis Ramah was fatally shot by a bandit at his business place and home, his son, Nigel, had voice frustration about not being granted a firearm license despite making several applications to police. Going plastic (using credit and debit cards) and using cheques and other non-cash methods of payments is something that the private sector should consider, Persaud said. The presence of large sums of cash on persons or business premises increases the risk of robbery. 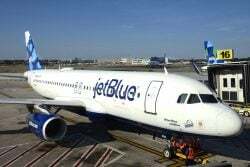 It is anticipated, based on data accumulated by the GPF, that if Guyanese go plastic the number of armed robberies will decrease by as much as 70%. In recent weeks, robbers have attacked two East Demerara businesses, broken into their safes and escaped with cash. Gafoors Land of Canaan Complex and Engineering Construction Incorporated (ECI) were the targeted companies which suffered losses amounting to millions. 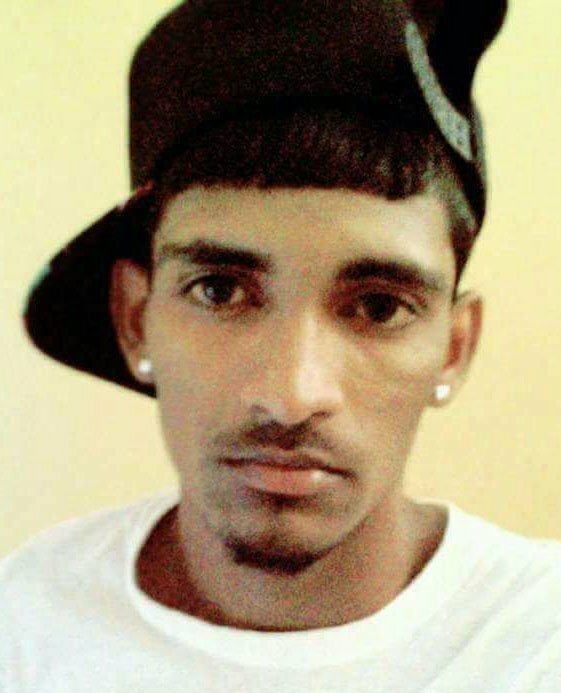 In August, De Hoop businessman Lakeram Bishundial was fatally shot by an armed bandit at Hope, East Coast Demerara. 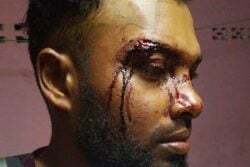 Bishundial had been carrying a bag containing an undisclosed amount of cash and had stopped along the road to speak with his brother, Totaram, when they were attacked. Reducing the number of cash transactions, Persaud stressed, will most definitely decrease risk and the number of armed robberies. It is no longer fashionable, sensible or safe to go shopping for a car with a bag full of cash, he said. 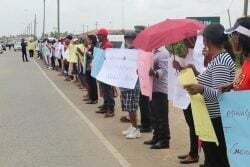 A number of persons carrying large amounts of cash to make purchases have been the victims of brutal attacks this year. Delivery and sales trucks which accumulate cash from customer locations are being continuously targeted. 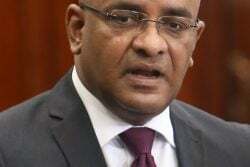 Vehicles which transport cash from a business place to the bank are also high on the target list of gunmen, Persaud noted. These are definitely sections of the commercial sector which should use the non-cash payment services available, he said. It is the responsibility of the financial system, Persaud noted, to trigger this change over. This change, he noted, is one which will have to occur over a period of time and before it can be executed the infrastructural support will have to be implemented and our culture altered. Persaud believes that embracing technology will act as a preventative measure to these crimes.